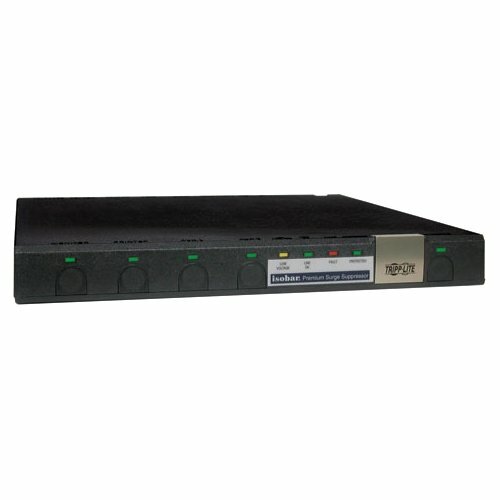 Tripp Lites MT 6PLUS (TouchMaster Plus) under-monitor console surge suppressor offers convenient AC and phone line computer power protection, individually controllable outlets and multiple power switches for remote control of connected equipment. High grade protection circuits utilize Tripp Lites Isobar protection system with a generous combination of high quality components and unique noise filtration system. Robust surge suppression circuits with sine-wave tracking offer extreme levels of protection against the heaviest surge conditions exceeding IEEE 587 category A & B specifications. Isobars unique protection system combines large torroidal chokes, HF/VHF capacitors and multiple layers of metal oxide varistors into exclusive isolated filter banks that remove EMI/RFI interference. MT 6PLUS offers 6 outlets total, 4 individually controllable via front panel mounted switches, one completely unswitched and one controlled by the master switch. Surge suppression rated at 1440 joules prevents equipment damage due to transient surges. Diagnostic LEDs confirm power availability and protection status, plus offer indication of line fault, suppressor fault and low voltage conditions. Includes 10 foot AC line cord. Space-saving under-monitor design offers convenient protection and power control of computers and all system peripherals. Lifetime warranty with $100,000 Ultimate Lifetime connected equipment insurance (USA & Canada Only).